Leatherman makes high quality products and i have no doubts. The picture is just symbolic because it shows a strap cutter that is also used sometimes for a belt-cutter. 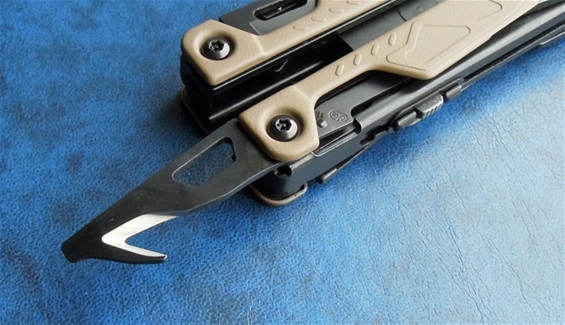 The OHT got many functions besides this strap-cutter that are better designed for rescue. It is a very good tool. I prefer SAKs because they are closest to my philosophy of use. At Similar designs can be found single in a very small format in a plastic holder. Some are designed to be held between two fingers and some got a very small handle. Some are also larger in size and are designed to cut more than just flat materials that are thin. I do not agree that these are sufficient rescue blades. They are made to be used in a pulling motion and sometimes it requires force. First it is the little size that is the problem and designed for flat materials. It is difficult for many to have finger strength enough to pull it across the seat belt. Because it is very small it can disappear easy. It must be stored or hanging from a known location all the time. When these cut they have a tendency to fold the seatbelt and this makes the belt material thicker and it will require more force to cut. They are better than nothing that said. In a car it can be either the rescue personnel or the person trapped inside that must cut free. Upside down is a thing that confuses people and sometimes things are damaged so one cannot release the belt. When you drive into a lake or water then you only got a few seconds to cut free before you are under water. Small belt-cutters will be dangerous to rely on. A safety knife must be in a pouch that you can reach all the time. It must be OH and have a locking mechanism. It must have some size and be a professional rescue blade. Another factor with small belt-cutters is that it does not cut evenly across, it may wander a bit in the material before you are released. Professional rescue blades cut controlled, precise, secure and fast. Some single small cutters are also designed to be pushed and that is even worse..